To be eligible to participate, you must be between the ages of 18 and 65, a U.S. citizen, be able to provide legal consent, and be a member of one of the targeted groups above. Participants will complete an online survey requiring approximately 20 minutes. One hundred participants will be randomly selected to receive a $25 gift card. However, there is no guarantee that everyone who completes the survey will be selected to receive the gift card. If you are interested in participating, the VCU-RRTC needs your consent. You may do this by following the link below to read more about the study, review the survey questions, and give your consent. 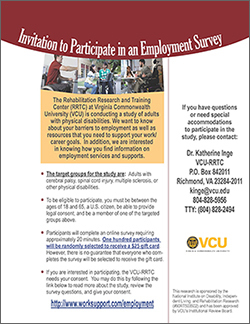 This research is sponsored by the National Institute on Disability, Independent Living, and Rehabilitation Research (#90RT503502) and has been approved by VCU’s Institutional Review Board.